Click on the red flag and select Directions in the panel. Enter your hotel or apartment address in the A panel below the map to see the suggested route and directions. Google maps have not yet provided an accurate location for our address, 25b Via Degli Aranci, and for this reason we have provided the map coordinates: 40.623191, 14.372811 together with the following guide. 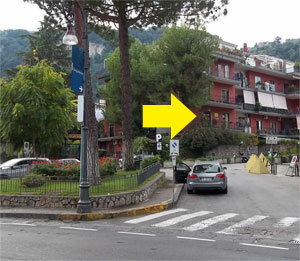 Route from Tasso Square to Friends of Sorrento Information Desk. Follow Via degli Aranci until you come to Miccio’s Trattoria where directly opposite you will see a grass island with trees and signposts, follow the road up past this island about 50 m until you come to a Pink office block. We are located in the first floor and there is an intercom on the left of the large glass doors. Select Goldentours, with whom we share space, to open doors and take the stairs on the left.